They say the arrangement will be a good bargain. Following the ban on import of certain vegetables, commercial vegetable farming picked pace in Dagana. 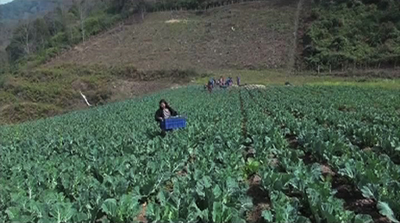 It is in competition with the neighbouring district of Tsirang, which is often considered the country’s hub for organic vegetable production. Today, most farmers of Dagana bring their farm produce to Thimphu for marketing. But, more than the transportation hassle, they are concerned about the unreliable market. “Earlier, I took my cabbages to Thimphu. I couldn’t sell it. So, I kept the produce with a wholesale dealer known to me. However, I did not get any money from its sale. Now, we are targeting the schools here. They depend mostly on imported vegetables. If we can strike a deal with the school authorities, we are planning to increase our vegetable production,” Passang Dorji, a farmer, said. “We grow all sorts of vegetables and people here are interested to take up its farming. But the inconsistent market has been the discouraging factor,” Namgaymo, another farmer, said. The issue was discussed during the recent Dzongkhag Tshogdu as well. “We can assure there won’t be any problem with vegetable supply. We have many growers. Today, most vegetables are imported from India. So in summer, its transportation becomes challenging. We request the Dzongkhag Tshogdu to guide us in providing organic vegetables to our children,” Karma Tshering, the Drukjeygang Gup, said. “Farmers in Tsenda-Gang are also facing marketing problem. We use to bring our vegetables to Daga town turn-wise. But only a handful of residents would buy. We had to take our produce back,” Bal Bahadhur Rana, Tsenda-Gang Gup, said. “The school authorities are willing to take only part of our part of our vegetables. We do not understand their justification. Whatever we have been selling are in small scale,” Pema Wangmo Tamang, the Gesarling Gup, said. Although the district education officer welcomed the idea, there are rules of procedure to be followed. He added schools are currently handicapped with a limited budget. The monthly stipend per student is Nu 400. “Farmers are asking the schools to buy their produce. According to the rule, we can buy vegetables only through a bidding process. I think there is a gap between the policies and strategies. We do fully support and want our children to be fed with organic vegetables,” Tshewang Penjor, the Chief District Education Officer, said. The Dzongkhag Tshogdu decided to allow registered farmers’ groups to participate while bidding for tender quotation to supply vegetables to schools in the community. Vegetable suppliers and schools will also be advised to go for locally available vegetables.